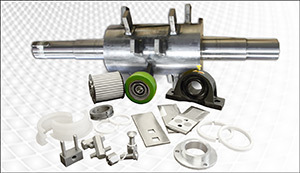 MPD’s spare parts department is committed to getting you the correct parts for your machine promptly. We also rebuilt and repaired many parts, such as crusher rotors and sizing screens/grids. Machine and Process Design’s equipment is designed and built to last. Whether it is consumables, or an accident occurred our spare parts department is committed to providing you the parts you need to keep your machine running. We understand that when a piece of equipment goes down it can shut down an entire production line, costing you money. We encourage stocking spare parts, however if not, we offer expedited delivery for parts so when it’s an emergency we can help. Talk to an expert about your application today! Our lab is waiting to test your material on our equipment.